I recently had the good luck to find four 1.25" front sway bars from 1970-81 Pontaic Firebirds/Formulas/Trans Ams at the salvage yard and have learned a few tricks on their removal. The bars are a direct bolt on for 1968-72 Skylarks/GSs. Most salvage yards have 1975 and up models.The earlier cars are not that common. Look at the front sway bar and you will see one of three different sizes 7/8",1 1/8" or 1 1/4". The last one is more common on Formulas and Trans Ams but check all models. 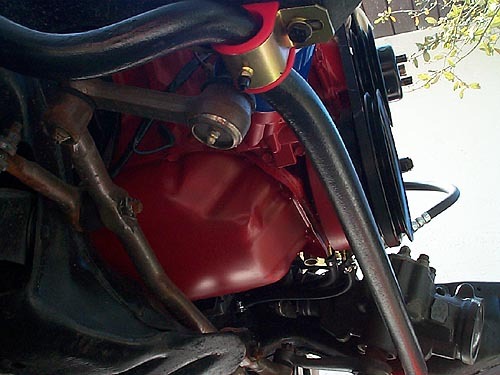 The 1979-81 models use 10mm screws to hold the front brackets on the frame. The earlier models use 5/16" socket head cap screws. So, always carry a 10mm socket just in case, The hex head screws are very easy to break loose after spraying some penetrating oil inside the frame on the threads protruding above the retaining insert. A problem arises when you encounter the socket head cap screws. I use a 5/16" allen wrench and an adjustable wrench to turn the allen wrench the first time I encountered these screws. It is a lot easier if you purchase a socket head screw socket. It is a regular socket that has a short piece of 5/16" hexagonal rod welded in which makes the job much easier. Every so often, you will encounter a screw that does not break loose but the insert does instead of the screw. If you use a chisel driven between the bracket and frame, you can usually apply enough pressure to prevent the insert from turning. If all else fails, a hacksaw will cut the screw very slowly if you can get the blade between the bracket and frame. It all depends on how determined you are to remove the brackets. 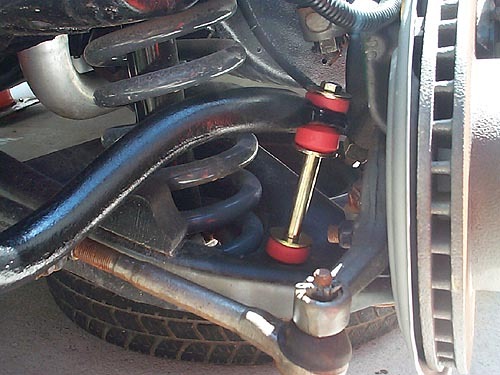 When installing the front sway bar, apply some grease to the two mounting bushings. The grease is supplied in the JC Whitney kits. If you skip the grease, you will hear a squeal as the bar rotates in the bushings. 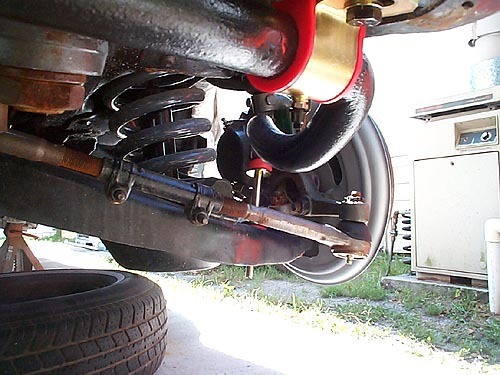 Also, on 1971-2 Skylarks/GS models, they use larger tie rods and sleeves than the earlier models so clearance between the steering linkage and the bar is important. If the linkage rubs the bar, you will need to increase the length of the sleeve in the end link kit to raise the bar away from thre steering linkage. Total installation time is about 30 minutes. This shows the clearance between the bar and tie rod end. Here is the Perfect Circle end link kit installed. The sleeve length is approximately 3". This is on a 70 car. Should also clear 71-2 models with larger diameter tie rods and adjusting sleeve. Pic shows new mounting bushings with grease fittings to prevent squeaks.